I have graduated from “10 January 1979 High School” in Siem Reap, Cambodia in 1993. Since then, I have entered a monastic life up to present. I have not worked outside of the religious employment. I first studied the Buddha's teachings and practised meditation in Wat Preah Indra Korsa, Siem Reap, Cambodia. At the same place, I also taught English language and mathematics to novices and monks. I was offered a fellowship opportunity to pursue higher education and from 1997 to 2000, I pursued furthr studies at Mahachula Buddhist University in Bangkok, Thailand. Each summer, I assisted as a mentor in the Moral Outreach Projects for Thai Young Children held in almost every part of Thailand . 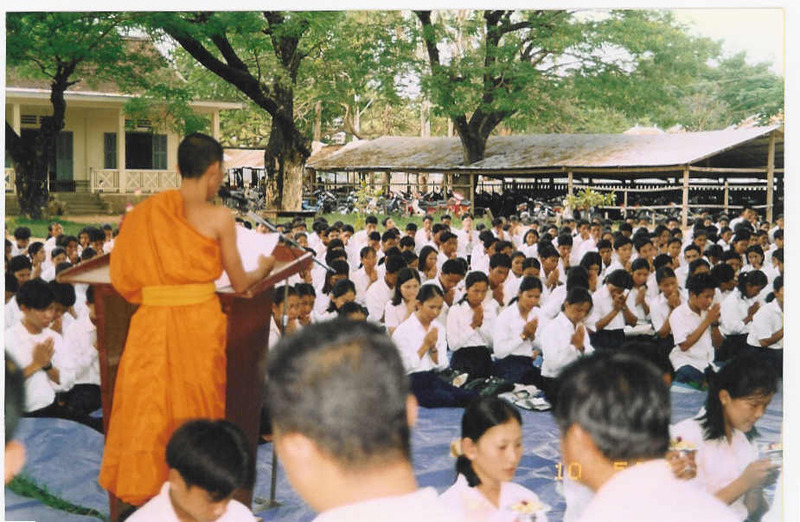 In my last two years there, 1999-2000, I managed this project and set up a team of Cambodian monks to instruct Cambodian students in primary schools, secondary schools, and high schools as well as children in remote areas and the general public throughout Cambodia. We focus on eradicating illiteracy and enhancement of ethics. We have instructed almost 15,000 participants now. Presently, this project is still being carried out by the same team. I also co-founded the Khemera Students Association in Thailand in 1998. The Association focuses on strengthening friendship and unity among Cambodian students and helping each other in times of crisis. I came to Canada on the invitation of the Cambodian-Canadian Association in Canada. Since arriving here, I have coordinated, facilitated activities among the different ethnic groups and mediated for Cambodian community members. I am also an active member of the International Buddhist Foundation of Canada and a steering committee of FaithLink Organization which focuses on ending Domestic Violences. 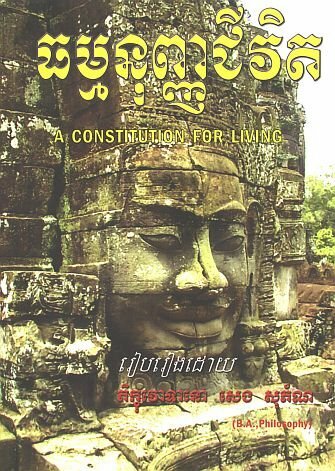 In the meantime, I teach Vipassana meditation to Cambodians as well as the local people, conduct ritual blessings, and teach the Khmer language and culture. As a project coordinator, I also manage the Khmer Language School on Saturday and Sunday to instruct children in morals, Khmer culture and Khmer language. I also organize workshops and conferences. I am consistently promoting peaceful living in families in an effort to end domestic violence. As we know, the happiness of a family is a fundamental basis for peace in the world. I presented "The Buddha's Teaching to End Domestic Abuses" at the Bridging to End Domestic Violence Conference of FaithLink and have participated in many other social workshops. Presently, I have tried to utilize my knowledge and capacity to better the Cambodian community and other affiliated societies. I also try to seek new experiences by involving myself in current issues. But I am not satisfied with my current abilities which I think is inadequate to meet the philanthropic task I have set for myself. I am still seeking reliable avenues that could help me improve my leadership skills and achieve my passion. I will try to achieve this passion which I have held so long - to rebuild peace and advancement for Cambodia and the world community. - Focusing on education development for ethical awareness, leadership, reconciliation, unity and peace. - Strengthening and enhancing Buddhist education and monastic leadership in community-based development. - Promoting Buddhist education to be equivalent to secular education and to modernize the methodology of instruction following other developed countries. This will be important to encourage the Buddhological pedagogy which encourages full freedom for learners. - Forming and supporting the concept of Buddhist and secular education as united components in maintaining sustainable development in Cambodia. 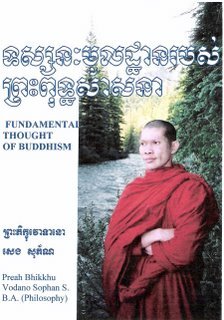 - Adapting Buddhist curriculum such that it is applicable for for monk students and strengthening social ethics through the use of Buddhist ethics in secular schools. Most of my work which I have done on a volunteer basis. I have dedicated myself to serving others, especially the people of Cambodia who are still traumatized by decades of civil war. Despite, having helped some people and communities, my heart constantly thinks of Cambodians. They continue to suffer from starvation, domestic abuse, human trafficking, child prostitution, high illiteracy rate, high child mortality rate and unequality in social living. Among these disadvantageous current issues, the high rate of illiteracy is my most concerned. This deficit truly caused by the failure of proper education leadership development.